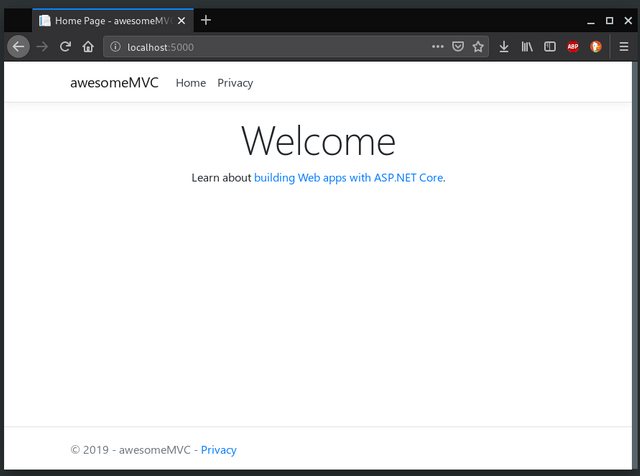 In this tutorial, you will be able to create a simple ASP.NET Core MVC app working with Docker. But before starting code, let’s talk about these technologies: I’m sure, you have listened about .NET Framework, but what about .NET Core? What about Docker? Well, it’s time to put all on site. 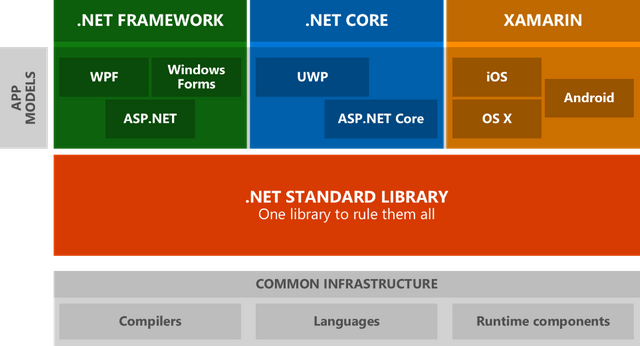 .NET Framework is the original .NET implementation that has existed since 2002. It contains additional Windows-specific APIs. The .NET Framework is optimized for building Windows desktop applications. .NET Core is a cross-platform and open source implementation of .NET for creating web apps, micro services, libraries and console applications that run everywhere (Windows, macOS and Linux). Xamarin is a .NET implementation that you can create native Android, iOS, macOS and Windows apps. 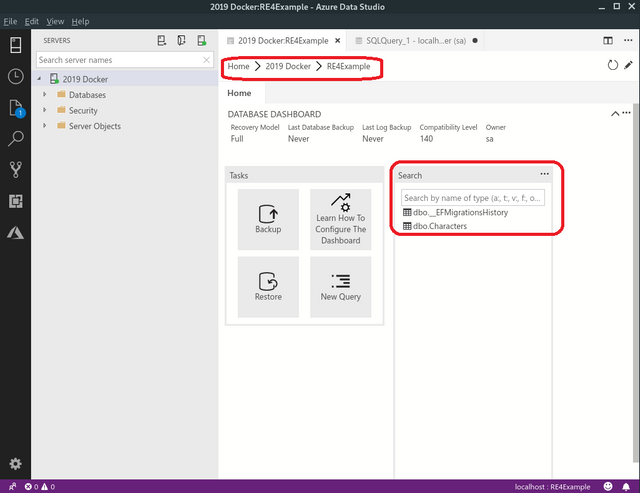 .NET Standard solves the code sharing problem for .NET developers across all platforms by bringing all the APIs that you expect and love across the environments that you need: desktop applications, mobile apps & games and cloud services. In the past, we only had a .NET Framework that is mainly a large and monolithic framework that has to be installed in full per machine (or you can’t use it) and allows the creation of console, desktop, web and mobile applications, where they run only on Windows. Lighter and more modular: you don’t have to install the entire .NET. Instead, you can choose what you want for developing. Multi-platform: The applications created with this technology will work on Windows, Linux, and MacOS. High performance: .NET Core has a higher performance than the traditional version, which is very important for Cloud environments, where this translates into a lot of money saving over time. 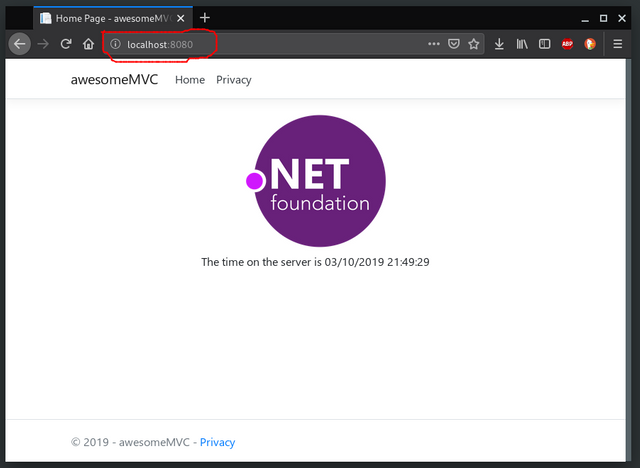 Now we know that .NET Core is a powerful implementation of the .NET platform that allows us to develop, for example, a modern cross-platform web app with the C# program language on a Linux OS! Can you believe it? The software Docker is a platform that allows you to build, test and deploy applications quickly. The open source Docker community works to improve these technologies and benefit all users for free. The company, Docker Inc., is behind the development and maintenance of the Docker software. With Docker, you will never say the phrase “but it worked in my computer!”, because you can package all dependencies together with the software code to make your app working in a container and run it everywhere! Is Docker a Virtual Machine? 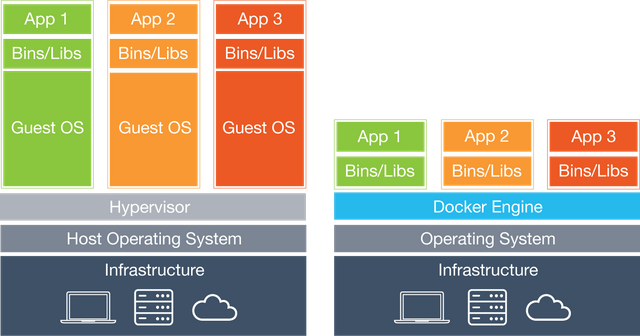 Docker is not precisely a Virtual Machine. Virtual machines are a sandboxed environment, which contains an entire computer with its virtual hardware, OS and software; booting up a virtual machine can sometimes take a few minutes to boot up. Containers are a lightweight alternative to full machine virtualization since they are commonly used to sandbox a single application. Containers use the host OS’ kernel, and thus no bootup time is needed. So, containers are faster than Virtual Machines. Containers, containers, containers… What is that and why it’s so important? Well, here is the core of Docker: Containers are standardized units that have everything the software needs to run including libraries, system tools, code, and runtime. Docker packages software into containers that lets you quickly deploy and scale applications into any environment and know your code will run. How can we run our containers? To do that, we need images. An image is an executable package that includes everything needed to run an application: the code, a runtime, libraries, environment variables, and configuration files. So, we can say that a container is a runtime instance of an image. Another important thing about images is that we have available to download official images in the repositories that Docker offers at Docker Hub, which is a cloud-based registry service that includes private and public image repositories. Let’s code our first .NET Core app! 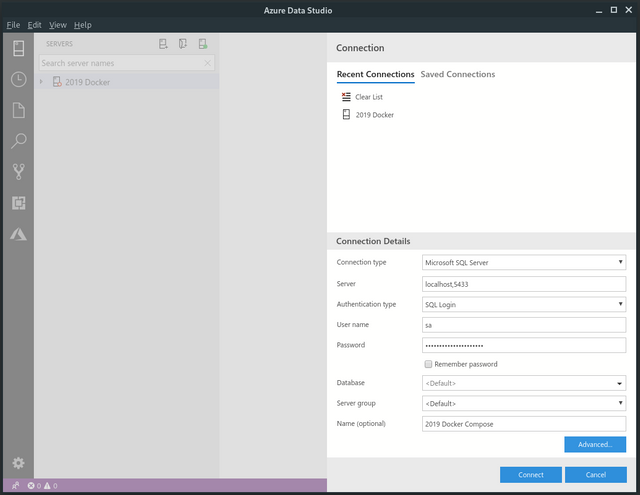 .NET Core SDK: the Software Development Kit (SDK) of .NET Core. We need it to create applications and libraries. Visual Studio Code: optional. VS Code is a powerful cross-platform text editor from Microsoft. It’s very handful for its integration with and Docker. As you saw at the beginning of this tutorial, we’re going to use a Linux OS. In my case, I will be using Manjaro, which is an Arch-based Linux distro. But don’t worry: the only difference is mainly the installation phase of .NET Core and Docker. If you’re using Windows/macOS, you can still follow me! OK! 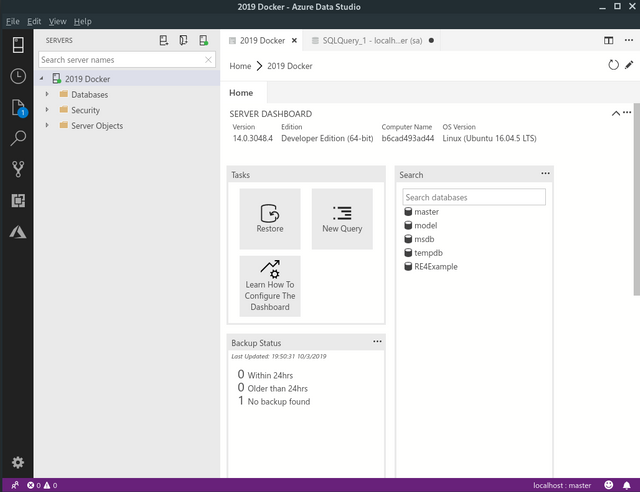 First of all, we need to install .NET Core SDK and Docker in our machine (links under requirements). For linux users, we have this page to install Docker with depending on your Linux distro. 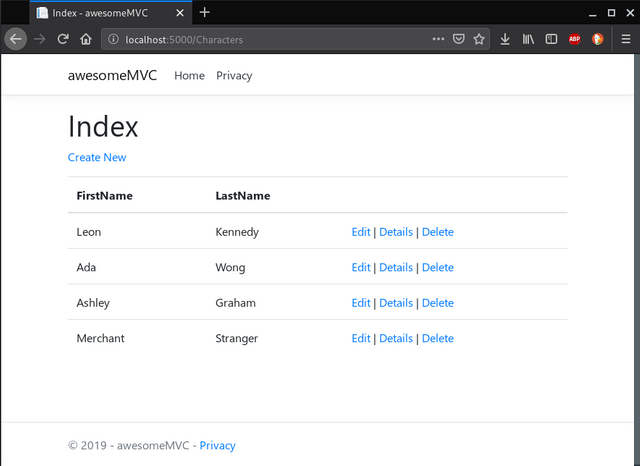 The mvc parameter selects what template to use when creating your app. 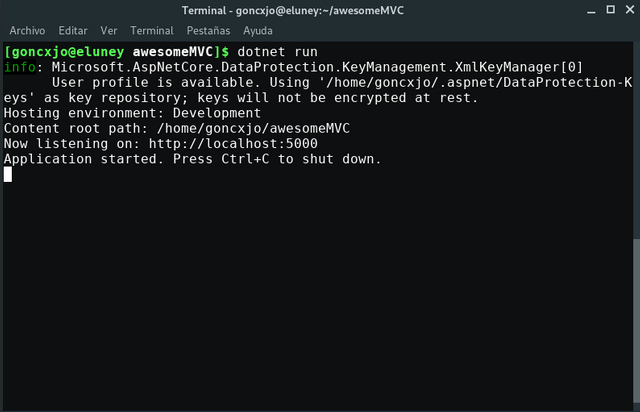 The -o parameter creates a directory named awesomeMVC where your app is stored. 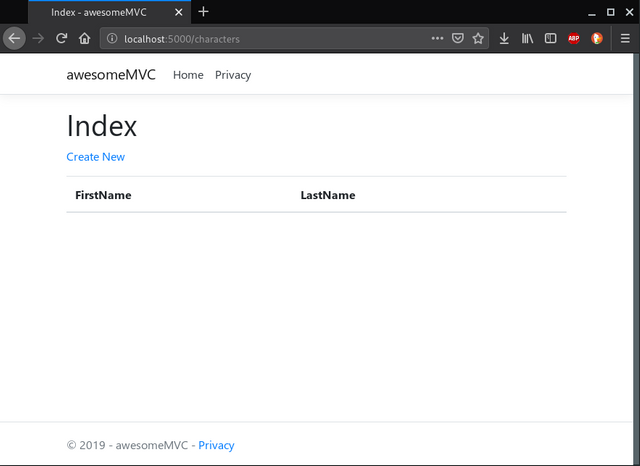 The awesomeMVC/Views directory contains some example web pages for the application. awesomeMVC.csproj defines what libraries are referenced, etc. Save and refresh the browser. Docker can build images automatically by reading the instructions from a “Dockerfile”. A Dockerfile is a text document that contains all the commands a user could call on the command line to assemble an image. So, in the project’s folder, create a file named “Dockerfile” and add the text below. The Dockerfile assumes that your application is called awesomeMVC. 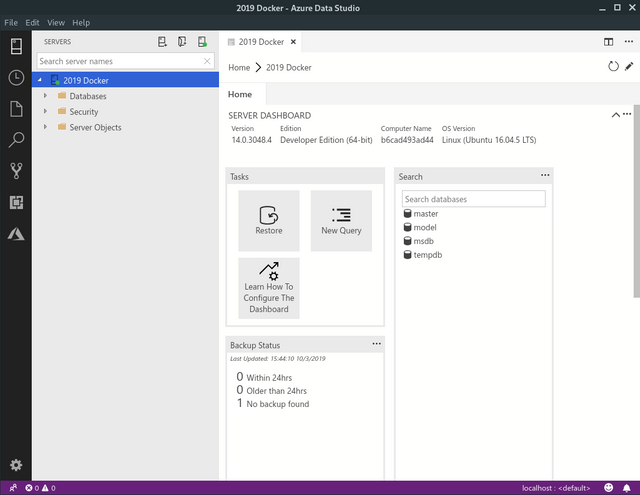 Change the Dockerfile to use the DLL file of your project. To make your build context as small as possible add a .dockerignore file to your project folder and copy the following into it. 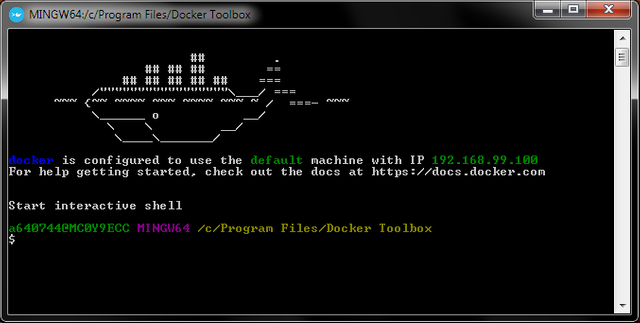 $ docker build -t awesome-mvc . Go to http://localhost:8000 to access your app in a web browser. 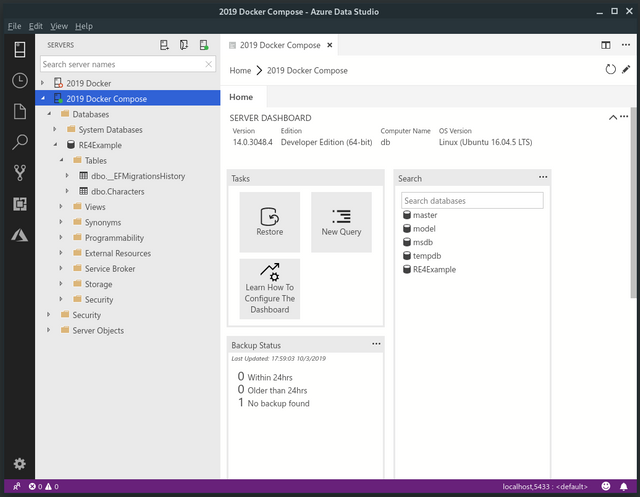 Docker Compose: with this tool, we can build our multi-container app, as we said. -d specifies that we want to start a detached container (runs in background). Great! Now let’s get to creating our models. We are going to model some characters from Resident Evil 4 (man, I like this game!) and we will define items in a single file since it is such a simple example. Now we need to wire up the database context with the dependency injection framework. To do this open `Startup.cs`` and add the add the new lines. With those added to the list of using statements, we can now modify the ConfigureServices method to add our code. // This is the new code. 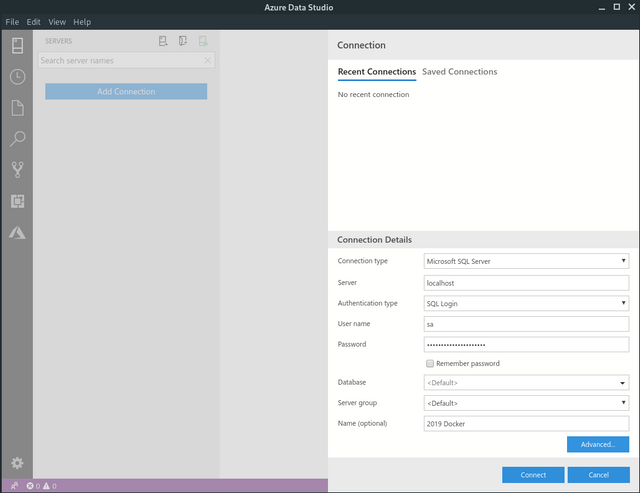 With our connection string, the last step to do before we run our migrations is to create our RE4Example database. 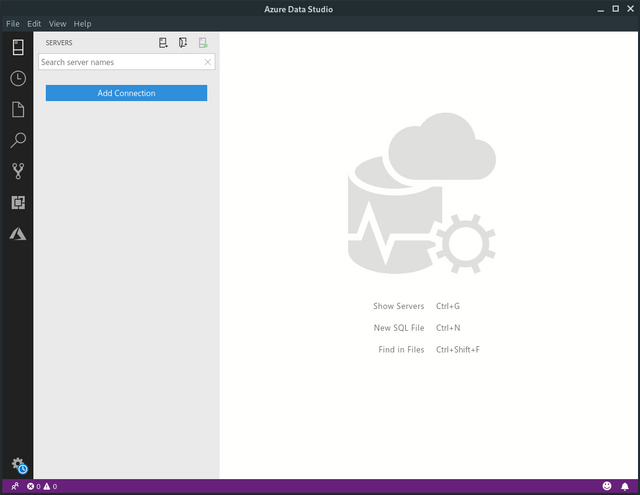 We can do this with Data Studio. Open it up and click on New Query. With that window open, type “sqlCre” and a snippet will pop, just hit enter. 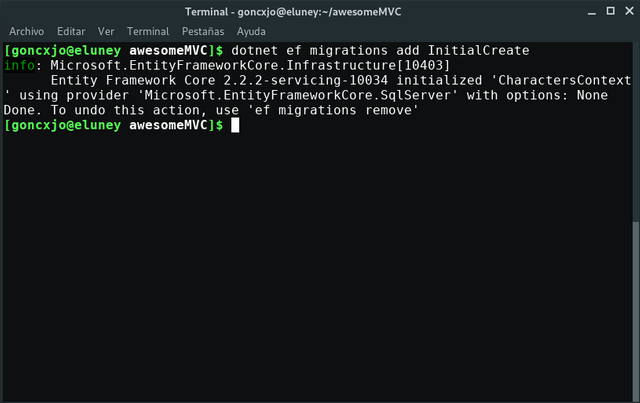 Now we are ready to create our Entity Framework migrations and create our tables. Run the following command to create the migration. Now run the migration to create the tables. Now we can generate our controllers and views with the scaffolding tools. Now let’s run the application. Dockerfile: this file defines how to build the web app image. entrypoint.sh: this script restores the database after it starts up, and then runs the application. This allows some time for the SQL Server database image to start up. docker-compose.yml: this file defines the web and db micro-services, their relationship, the ports they are using, and their specific environment variables. 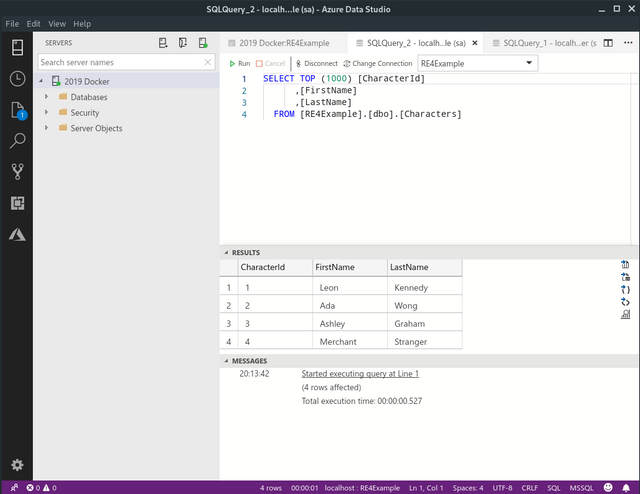 >&2 echo "SQL Server is starting up"
>&2 echo "SQL Server is up - executing command"
Then, go to http://localhost:8000/characters on your favorite browser. Congratulations! Your app .NET Core app with SQL Server is working thanks to Docker Compose! If you can’t wait, you can clone and run this project in this github repository. I can’t build the project: Have you allocated at least 4GB of RAM in your virtual machine? I can’t connect to the localhost: be sure to connect to the IP indicated at the start of Docker Toolbox CLI. Are shell scripts sensitive to encoding and line endings? Congratulations @goncxjo! You received a personal award!